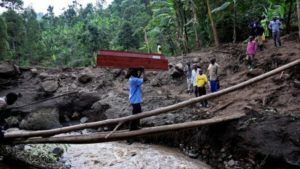 Probashbangla24 online Desk : The death toll from a landslide in Uganda last week has risen to 43 and displaced residents deemed most at risk in the disaster-prone region will be resettled immediately, the government said on Tuesday. Torrential rains unleashed a deluge of boulders, mud and water down Mount Elgon near the border with Kenya, uprooting trees, pulverizing homes and burying residents in the town of Bukalasi and some nearby villages. Landslides have become more common in mountainous parts of the East African country in recent years because of expanding settlement and cultivation that have denuded mountainsides of forest cover and other vegetation. A government statement put the final death toll at 43, up from an initial figure of 31, and said a further 21 people were injured with around 800 left homeless. It said the cabinet had “directed resettlement of persons at risk of (further) landslides to begin immediately”. Around 32.7 billion shillings ($8.66 million) had been allocated to finance emergency relocations of the most vulnerable people. A 2,800-acre plot had been procured for relocations, with a further 5,500 people also vulnerable to landslides to follow the initial 800. In all, some 100,000 people deemed to be living in the likely path of landslides will be resettled in coming years. A 2010 avalanche on Mount Elgon killed 150 people. Voice of Non Resident Bengali's Around the World.